DESCRIPTION Â This non-sticky, moisturizing lip gloss is your shortcut to nourished, fuller-looking lips with a splash of L.A.-inspired color. 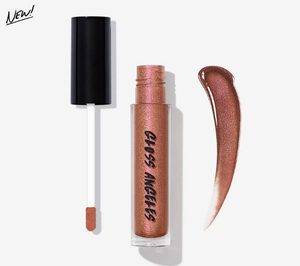 Memu wears Sheen Writer (vivid fuchsia shimmer) Medalion wears Hustle & Glow (rose gold shimmer) TIPS Â Use as a lip topper for a glossy lipstick effect. 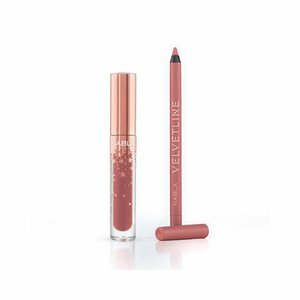 BENEFITS Â â¢ Hyaluronic Acid hydrates & plumps lips â¢ Vitamin E nourishes & keeps lips soft â¢ Evenly builds sheer to medium color â¢ Cruelty free USAGE Â One swipe on lips for sheer color & layer to add medium color. INGREDIENTS Formulated without: gluten, silicone, phthalates, parabens, mineral oil, formaldehyde, hydroquinone, triclosan, triclocarban. Ingredients: Hydrogenated Polyisobutene, Octyldodecanol, Ethylhexyl Palmitate, Silica Dimethyl Silylate, Ricinus Communis (Castor) Seed Oil, Tocopheryl Acetate, Sodium Hyaluronate, Glass Beads, Calcium Sodium Borosilicate, Synthetic Fluorphlogopite, Calcium Aluminum Borosilicate, Silica, Tin Oxide, Caprylyl Glycol, Hexylene Glycol, Hydrogenated Castor Oil, Flavor (Aroma), Benzyl Benzoate, Phenoxyethanol, Â Please be aware that ingredient lists may change or vary from time to time. Please refer to the ingredient list on the product package you receive for the most up to date list of ingredients.